The new Valken Crusade line hit the store this week, so we thought we’d throw up some info and initial thoughts on the products. We’ll start it off with the jerseys in this write up and see where it goes from there. On first glance, these jerseys are very impressive. They have a lightness about them that could be comparable to a basketball jersey and they seem very breathable. 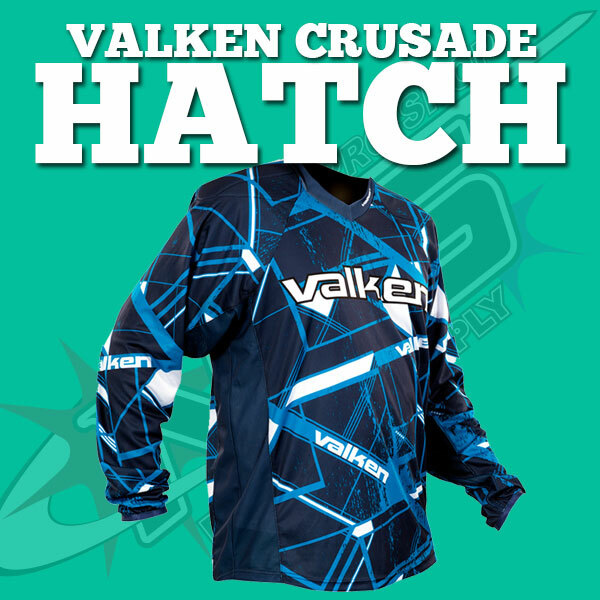 Not to mention, we think this line has probably one of the coolest patterns we’ve seen in paintball in a long time. If you want to stand out from the crowd, this is the jersey to do it with. And with this coming in at a reasonable price point, it’s needless to say, first impressions were awesome. Now let’s dig into this more. Valken seems to have gone through and provided a great stitch on this that will allow for movement, and seems that it will hold up very well. It looks reinforced where it’s needed most (through the arms) and they’ve even gone through and embroidered a logo patch on the front of the jersey. The sleeve cuffs have a fairly good elastic in them to help keep your sleeves and pads where they should be. This jersey will last you a good while, especially if just for rec or light tournament play. We are very impressed with how lightweight this jersey is. It is using quality jersey material and mesh that feels fairly strong. It will be very easy to keep your cool in this jersey, which is awesome in the crazy hot summers that we often times experience in this neck of the woods. With that being said though, this would not be the jersey of choice for cold winter time play. Again, this is the coolest pattern for gear we’ve seen come in for quite some time. The sublimation on this seems solid with vivid colors that look great. Again, still very impressed with the embroidered logo on the front as it seems no one else really does this any more. Also has a great. rubberized logo on the collar that just screams class. It’s vented where it should be: Up and down the sides and under the arms. 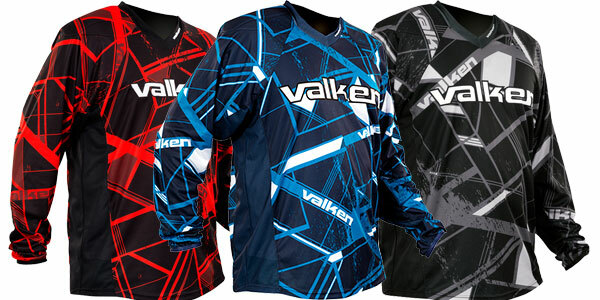 Valken is using a quality jersey mesh that feels amazing, and is incredibly lightweight. This is going to be one of the most breathable jerseys on the market, so if you’re looking for a jersey that’ll keep you cool, check this one out. The jersey does seem to have “ok” padding where it counts (shoulders and upper chest region), and minimal forearm/elbow padding, which, probably isn’t a huge deal as I’m sure many players that pick this up will already have or be getting a set of elbow pads. However, this would be the one fallback on the jersey, is it’s lack of padding by comparison to other jerseys in its price range. If you’re looking for a jersey that will get you a lot of bounces, this not the one. However, the padding does sit and bend well, which, there is a lot to be said about being left more mobile. This jersey scores well across the board in most categories accept for the amount of padding. Starting off at $49.95 though, it is something that I could probably look over for all the other perks that come with it, including the sheer amounts of style that come from wearing this. You’ll look so hot, it’s sure to give you open shots on players that are just standing there checking out how sick your jersey is. Definitely worth a look.